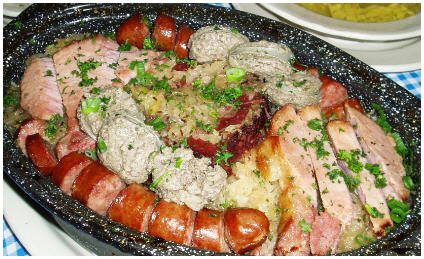 A traditional delicacy: Enjoy fork tender cured and smoked Pork cooked in Sauerkraut together with other sausages. In this picture we are serving a smoked, poached Kielbasa style sausage and melted coarse liver pate together with a smoked pork chop. Served with pea puree and mashed potatoes.